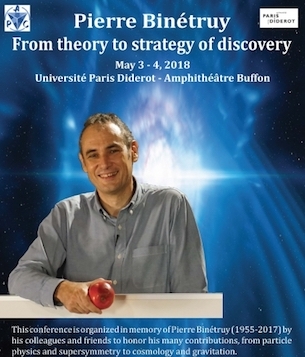 This conference is organized in memory of Pierre Binétruy (1955-2017) by his colleagues and friends to honor his many contributions, from particle physics and supersymmetry to cosmology and gravitation. In addition to seeking scientific truth, he had the courage to organize the community for the scientific goals that this truth imposes, and also to fight within the institutions to defend them: from the leadership of the French and European Supersymmetry Research Group (GDR) to the founding of the Astroparticle and Cosmology Laboratory and to the organisation of the French participation to the space mission Lisa. In order to honour all aspects of his activity this conference will present Pierre's scientific achievements as well as personal recollections.